They claim it can keep any size paint brush fresh for days or even weeks so you don’t need to clean up between coats. It fits over round one-gallon metal cans. That’s all the information they give. We get no details about what it’s made from, what it’s packaged in, or even how to properly use it, just eco-babble. The paint brush storage lid runs $8 at Prazi’s online store — unfortunately they won’t even give you shipping information until you enter a credit card, so you’ll understand why shipping charges aren’t listed. Putting the brush in a plastic sandwich bag in the refrig will do the same thing. But every time you open the fridge a baby seal dies. Saving the environment shouldn’t be synonymous with buying stupid crap from china that pollutes more than a bit of spilled paint would in the first place. 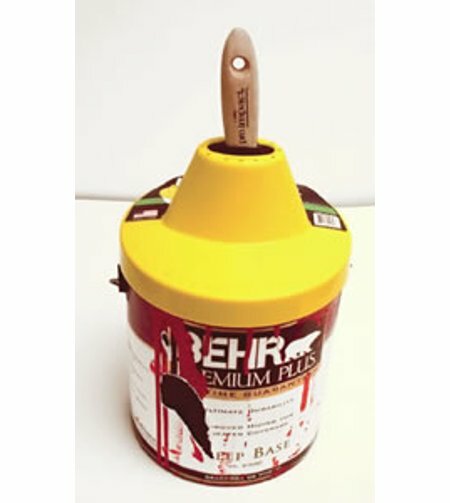 More economic choice for storing a paint brush in paint: a wet rag, laid over the top of the paint can. it will keep the brush from drying out and the paint from hardening. make one out of a 1 gallon milk jug… free after wonder liquid joy. Got milk?